The E Street Band is an American rock band, and has been musician Bruce Springsteen's primary backing band since 1972. The band was inducted into the Rock and Roll Hall of Fame in 2014. The band members have also performed and recorded (both individually and as a band) with a wide range of other artists including Bob Dylan, The Rolling Stones, Meat Loaf, Neil Young, Lou Reed, Bonnie Tyler, Air Supply, Dire Straits, David Bowie, Peter Gabriel, Stevie Nicks, Tom Morello, Sting, Ian Hunter, Paul McCartney, Ringo Starr, Ray Davies, Ronnie Spector, Gary U.S. Bonds, Darlene Love, Southside Johnny, The Grateful Dead, Santana, Lucinda Williams, Steve Earle, Emmylou Harris, Tracy Chapman, Lady Gaga and Aretha Franklin. When not working with Springsteen, members of the band have recorded solo material and have pursued successful careers as session musicians, record producers, songwriters, actors and other roles in entertainment. The most well known in their separate careers are drummer Max Weinberg, who has led his own band, first on Late Night with Conan O'Brien and then on the Tonight Show with Conan O'Brien, from 1993–2010, and guitarist Steven Van Zandt, who starred as Silvio Dante in the HBO television series, The Sopranos, from 1999 to 2007, and as Frank "The Fixer" Tagliano in the current Netflix series, Lilyhammer. The E Street Band was founded in October 1972, but it was not formally named until September 1974. Springsteen has put together other backing bands during his career, but the E Street Band has been together more or less continuously for the past four decades. The original lineup included Garry Tallent (bass), Clarence Clemons (saxophone), Danny Federici (keyboards, accordion), Vini "Mad Dog" Lopez (drums) and David Sancious (keyboards). The band took its name from the street in Belmar, New Jersey, where Sancious' mother lived. She allowed the band to rehearse in her garage. ‘Bruce’ tourism to the area often mistakenly believe the house was on the corner of E Street and 10th Avenue, perhaps due to the song Tenth Avenue Freeze-Out about the band's beginnings. The Sancious house was at 1107 E Street with the garage squeezed between the house and the southside fence. Springsteen's debut Greetings from Asbury Park, N.J. appeared in 1972, and the band's first national tour began in October 1972. Sancious, even though he played on the album, missed that first tour. It was not until June 1973 that he began appearing regularly on stage with the band. In February 1974, Lopez was asked to resign, and was briefly replaced by Ernest "Boom" Carter. A few months later, in August 1974, Sancious and Carter left to form their own jazz fusion band called Tone. They were replaced in September 1974 by Roy Bittan (keyboards) and Max Weinberg (drums). Violinist Suki Lahav was briefly a member of the band before leaving in March 1975 to emigrate to Israel (where she would later find success as a songwriter and novelist). Steven Van Zandt (guitar, vocals), who had long been associated with Springsteen and had played in previous bands with him, officially joined the band in July 1975. This lineup remained stable until the early 1980s when Van Zandt left to pursue his own career, a move that was announced in 1984. He would later rejoin the band in 1995. In June 1984 Nils Lofgren (guitar, vocals) was added to replace Van Zandt; Springsteen's future wife, Patti Scialfa (vocals, later guitar), was also added to the lineup. By 2002, the band also included Soozie Tyrell (violin, vocals). Tyrell had earlier worked with Scialfa touring with Southside Johnny and the Asbury Jukes and sporadically with Springsteen dating back to the early 1990s. Whether Tyrell became as full-fledged a member as the others remains unclear. Some press releases refer to her as a "special guest", the cover notes of Live in Barcelona list her as a "with" member, the liner notes of We Shall Overcome: The Seeger Sessions refer to her as "violinist with the E Street Band," and some press releases don't mention her at all. When asked about the lack of mention in a press release prior to the Magic Tour, Springsteen just said in response, "Soozie will be with us." On November 21, 2007, it was announced that Danny Federici would take a leave of absence from Springsteen and the E Street Band's ongoing Magic Tour to pursue treatment for melanoma, and was temporarily replaced by veteran musician Charles Giordano. Springsteen stated at the time: "Danny is one of the pillars of our sound and has played beside me as a great friend for more than 40 years. We all eagerly await his healthy and speedy return." Federici made his only return to the stage on March 20, 2008, when he appeared for portions of a Springsteen and E Street Band performance at Conseco Fieldhouse in Indianapolis. Federici died on April 17, 2008 at the Memorial Sloan-Kettering Cancer Center in New York City, having suffered for three years with melanoma. Springsteen's album, Working on a Dream, is dedicated to him. Giordano has since become an unofficial member of the band. Clarence Clemons suffered a stroke on June 12, 2011. He underwent two surgeries after which he was declared in serious but stable condition. According to Rolling Stone magazine, he had been showing signs of recovery. However, Clemons died from complications caused by the stroke on June 18, 2011. Clemons' nephew, Jake, has since filled his role on the saxophone as an unoficial member. On occasions (e.g. their Super Bowl XLIII performance) the lineup has been augmented by a horn section, sometimes referred to as The Miami Horns. Its most prominent members include Richie Rosenberg (trombone) and Mark Pender (trumpet). In the late 1960s and early 1970s, there was a vibrant music scene in and around the City of Asbury Park on the Jersey Shore. Prominent in this scene were Bruce Springsteen and Southside Johnny as well as the early members of the E Street Band. Clemons, Federici, Lopez, Sancious, Tallent and Van Zandt honed their skills in numerous bands, both with and without Springsteen. These included Little Melvin & the Invaders, the Downtown Tangiers Band, the Jaywalkers, Moment of Truth, Glory Road, Child, Steel Mill, Dr. Zoom & the Sonic Boom, the Sundance Blues Band, and the Bruce Springsteen Band. In 1972, when Springsteen gained a recording contract with CBS, he picked the cherries among Jersey Shore musicians to record – and to tour in support of – his debut album, Greetings from Asbury Park, N.J. By 1973, they had recorded a second album with Springsteen, The Wild, the Innocent and the E Street Shuffle. The E Street Band established its reputation among studio musicians in the 1970s and the 1980s with its significant contribution to the Springsteen albums Born to Run, Darkness on the Edge of Town, The River and Born in the U.S.A. However, unlike such backing bands as the Silver Bullet Band or the Heartbreakers, the E Street Band never received a full credit on a Springsteen studio album. Only individual band members were credited. Even though the band did all or nearly all of the playing on these albums, each was released solely under Springsteen's name. Indeed, the E Street Band is not even mentioned as such in any of the literature for these albums until an inside liner note for The River, and then a cover "Performed by" credit on Born in the U.S.A. Later albums such as Tunnel of Love and Greatest Hits did name the band and list the members. Concerts were a different story. Live performances were almost always billed as Bruce Springsteen & the E Street Band, and Springsteen pointed the spotlight on the brand logostyle of the band onstage. In each concert, Springsteen typically would extend one song (between 1974 and 1984, almost always "Rosalita") to involve an elaborate introduction of each member of the band, introducing nicknames, characterizing each player ("Professor" Roy Bittan, "Miami" Steve Van Zandt, "Phantom" Dan Federici, "Mighty" Max Weinberg, and Garry "W." Tallent), whipping the song and the audience into a frenzy for the final, over-the-top introduction of the "Big Man", Clarence Clemons. More substantially, Springsteen split concert revenues equally with the band members, a practice almost unheard of for backing bands in the music industry. Thus in 1979 when Springsteen and the band featured on the No Nukes album and No Nukes film, the live performance was credited to both. The band received their first full credit on a Springsteen album with the release of Live/1975–85, which was credited to Bruce Springsteen & the E Street Band. All subsequent live recordings and concert DVDs have also been credited to both. Meanwhile Van Zandt also began to establish himself a reputation as a producer/songwriter. Apart from helping out with production on Springsteen albums, he worked with his "other band", Southside Johnny & the Asbury Jukes, as well as with Ronnie Spector and Gary U.S. Bonds, before he launched his own solo career as Little Steven. The E Street Band and Springsteen regularly helped out on all these projects. In 1977, they recorded a single with Ronnie Spector featuring a cover of the Billy Joel song, "Say Goodbye to Hollywood", and a Van Zandt original, "Baby Please Don't Go". This was the first time the band received a full credit. In 1978, Weinberg became an "honorary Juke" when he recorded Hearts of Stone with Southside Johnny. In the early 1980s, the E Street Band helped relaunch the career of Gary U.S. Bonds, when it provided backup on two albums, Dedication and On the Line. Van Zandt produced both with Springsteen. Each album featured songs by Springsteen and Van Zandt, and a cover of the Cajun classic "Jole Blon". The moderate success of these albums earned Van Zandt a solo recording contract with EMI. Initially without a band of his own, he simply borrowed Clemons, Federici, Tallent, Weinberg, and an assortment of Jukes, including Rosenberg and Pender, to record his 1982 debut Men Without Women. This was released under the name of Little Steven & the Disciples of Soul. Other artists had also begun to recognize their talents and the band members were never out of work. Producer/songwriter Jim Steinman used Bittan and Weinberg on Meat Loaf's Bat Out of Hell and Dead Ringer; on his own Bad for Good project; Bonnie Tyler's Faster Than the Speed of Night and Secret Dreams and Forbidden Fire albums; and Greatest Hits from Air Supply, on the cut, "Making Love Out of Nothing at All" which featured an extra expansive Wall of Sound effect from Bittan & Weinberg. Also, Tallent, Bittan, and Weinberg, along with Mick Ronson, recorded an album with Ian Hunter titled You're Never Alone with a Schizophrenic. Bittan and Federici also provided keyboards for Garland Jeffreys on his Escape Artist, while the former would make notable contributions to albums by David Bowie, Dire Straits, Bob Seger and Stevie Nicks. Several of these albums acknowledged their contributions with a credit such as "courtesy of the E Street Band". Throughout the 1980s, members of the band were involved with various other projects. In 1985, Bittan and Van Zandt recorded sessions with Bob Dylan for his Empire Burlesque album. Although not used at the time, the recordings later surfaced on Dylan's The Bootleg Series. In 1985, Van Zandt spearheaded Artists United Against Apartheid. An album and single featured Springsteen and Clemons, among others. Tallent also produced a single with Jersey Artists For Mankind which featured Springsteen, Lofgren, Clemons and Weinberg as well as Carter and Rosenberg. Clemons teamed up with Sancious both on his solo album Hero and on albums with Zucchero Fornaciari. Clemons and Lofgren also went on tour with Ringo Starr and his All-Starr Band in 1989. In 1989, Springsteen informed the E Street Band members that he would not be using their services for the foreseeable future. 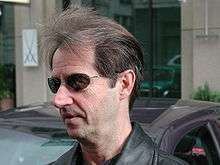 He had already recorded one completely solo album, Nebraska. The last full band activity had been autumn 1988's Human Rights Now! Tour. Band members started to go their separate ways and onto separate projects – Tallent to Nashville to work on record production, Federici to California, Clemons to Florida, Lofgren to Maryland to resume his long-time solo activities. Weinberg, besides an abortive try at law school, was putting together the band Killer Joe and recording an album. Scene of the Crime included a guest appearance from Little Steven, playing guitar on the Springsteen written instrumental "Summer On Signal Hill". In 1993, Weinberg became the band leader on Late Night with Conan O'Brien and remained such for its entire run. When O'Brien moved to The Tonight Show in 2009, Weinberg reprised his role as bandleader, and the show's house band – formerly called the Max Weinberg 7 – was redubbed Max Weinberg and the Tonight Show Band. In 1992, the E Street Band and the Miami Horns backed Darlene Love on the single "All Alone on Christmas" written by Little Steven and featured on the soundtrack for Home Alone 2: Lost in New York. Springsteen made guest appearances on solo albums by both Nils Lofgren and Clarence Clemons and he joined Max Weinberg, Garry Tallent and Little Steven when they reprised their role as "honorary Jukes" on Southside Johnny's Better Days in 1992. Springsteen also continued to use assorted members of the band on his forthcoming albums and projects. Roy Bittan would be retained for both Human Touch and Lucky Town. The former included a guest appearance from David Sancious while the latter introduced Soozie Tyrell. Patti Scialfa also provided backing vocals on both. Little Steven produced and played guitar on a remix of the single "57 Channels". However, the majority of musicians used on these albums were session musicians. The E Street Band was not used on the subsequent Springsteen tour either, although Bittan was again retained and Scialfa occasionally added backing vocals; both were consequently featured on In Concert/MTV Plugged. The Ghost of Tom Joad saw Danny Federici, Garry Tallent, Tyrell and Scialfa provide backing on some tracks while Federici, Tyrell and Scialfa all turn up sporadically on Devils & Dust. Although individual members of the band played on Human Touch, Lucky Town, In Concert/MTV Plugged, The Ghost of Tom Joad and Devils & Dust, none of these albums are regarded as E Street Band albums. Tunnel of Love falls into a grey area and its status is open to debate. In 1995, Springsteen released Greatest Hits and the E Street Band was temporarily reunited to record four new songs. In 1998, he released Tracks, a box set collection of unreleased recordings dating back to 1972, many of which featured the band. Finally in 1999, Springsteen and the E Street Band reunited on a more substantial basis, ten years after he had dismissed them. They staged an extremely successful Reunion Tour, culminating in an HBO special and collection Live in New York City. With the exception of Weinberg and Van Zandt, the band members had not found any career paths that could match the E Street Band for fortune and fame. Nevertheless, there seemed to be no long-term animosity from the split. In 2002, the reunion was continued with the release of new studio album The Rising and the long, successful Rising Tour. Another important release from this era was The Essential Bruce Springsteen, another greatest hits package combined with more archival material. The October 2004, the Vote for Change tour was the last E Street Band effort for a while. The 2005 Devils & Dust album used scatterings of Federici, Scialfa, and Tyrell, while the 2006 Sessions Band Tour used Scialfa and Tyrell among the largely numbered backing musicians. During the latter, Springsteen mentioned he did plan to work with the E Street Band again in the future, but was vague about details. The E Street Band in performance in November 2007 during Magic Tour; this was the next-to-last full performance of Danny Federici. Finally, in early 2007, E Street Band members separately traveled to Atlanta and recorded on Springsteen's album Magic, and concurrent with the album's release in October 2007, the Magic Tour began. However, after the conclusion of the tour's first leg on November 19, 2007, Danny Federici took a leave of absence from the tour to pursue treatment for melanoma; he was replaced by Sessions Band member Charles Giordano. Federici made his only return to the stage on March 20, 2008, when he appeared for portions of a Springsteen and E Street Band performance in Indianapolis. He died on April 17, 2008. Final frame of cartoon-style E! – Street! 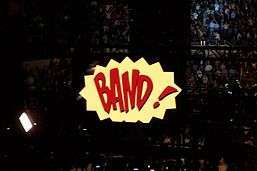 – Band! video screen sequence at the end of Magic Tour shows. Le-gen-dary E – Street – Band!" On the Magic Tour, the video screens around the stage added cartoon-like graphics to illustrate the final E! Street! Band! exclamation. In the wake of the passing of Federici and then Clemons, Springsteen amended the introduction to "testifying, death-defying, legendary E Street Band!" Bruce Springsteen and the E Street Band were the stars of the Super Bowl XLIII Halftime Show in Tampa, Florida on February 1, 2009. Springsteen's "heart-stopping ..." rap was included in the promotional material aired on NBC in the two months leading up to the performance. The sequence then got its biggest audience immediately prior to Springsteen and the band taking the stage at halftime, when a prerecorded series of football players from the game saying each phrase in turn was aired by way of introducing the performance. Prior to the game, on Thursday, January 29, Springsteen gave a rare press conference, where he promised a "twelve minute party". When asked if he would be nervous performing before such a large audience, Springsteen alluded to his recent January 18, 2009 appearance at the "We Are One" concert at the Lincoln Memorial, a celebration of Barack Obama's Presidential inauguration: “You'll have a lot of crazy football fans, but you won’t have Lincoln staring over your shoulder. That takes some of the pressure off.” The Super Bowl performance coincided with the release of a new album entitled Working on a Dream, released on January 27, 2009. The band's set, which ran a little over the allotted 12 minutes, included the songs "Tenth Avenue Freeze-Out", "Born to Run", "Working on a Dream" and "Glory Days". The Miami Horns and a large choir, the Joyce Garrett Singers, joined the band onstage. The E Street Band at the end of a Working on a Dream Tour show in May 2009. Jay Weinberg was subbing for his father on this show, and backing vocalists Curtis King and Cindy Mizelle augmented the lineup. Nineteen-year-old Jay Weinberg filled in at drums for his father, Max, during portions of shows, or for some full shows, during the 2009 Working on a Dream Tour. This was due to the elder Weinberg's obligations for the debuting The Tonight Show with Conan O'Brien. The 49-year age difference between the younger Weinberg and bandmate Clarence Clemons was one of the largest within any popular musical act . On June 12, 2011, Clarence Clemons suffered a stroke and died six days later from resulting complications, on June 18 at age 69. Steve Van Zandt wrote on his web site "We will continue to make music and perform. Let's face it, that's all we really know how to do. But it will be very different without him." On February 11, 2012, Springsteen announced that Jake Clemons, the nephew of Clarence Clemons, would tour with the E Street Band as the group's new saxophonist, splitting time with Eddie Manion. Augmented by a full horn section, an additional percussionist in Everett Bradley, and an additional singer and rapper in Michelle Moore, the E Street Band that undertook the 2012–2013 Wrecking Ball Tour was the largest yet. Guitarist Tom Morello, best known for his work with Rage Against the Machine, filled in for Van Zandt on some of the dates. On December 17, 2013, the Rock and Roll Hall of Fame announced that the E Street Band would be inducted in 2014 under The Award for Musical Excellence induction category. The band was inducted by Springsteen on April 10, 2014. Roy Bittan, Clarence Clemons, Danny Federici, Nils Lofgren, Vini Lopez, Patti Scialfa, David Sancious, Garry Tallent, Max Weinberg, and Steven Van Zandt were all inducted and each given time to speak, with the family/widows of Federici and Clemons representing their husbands. Following the induction, Springsteen and the E Street Band, along with Lopez, Sancious and The E Street Horns, performed a three song set of "The E Street Shuffle", "The River" and "Kitty's Back". The High Hopes Tour kicked off in January 2014 and concluded in May 2014. The band was again joined by the horn section and also joined by Tom Morello for the entire tour. Steven Van Zandt missed most of the North American leg due to filming his television series, Lilyhammer. The tour was in support of Springsteen's 2014 album, High Hopes. Jake Clemons role in the band had been expanded and his interactions on stage with Springsteen were like those of his uncle and Springsteen. In 2015, Springsteen announced plans for The River Tour 2016. Springsteen had originally planned a solo tour however felt that it would delay his next tour with the E Street Band for a few years so he decided to tour with them instead of a solo outing. A short tour was originally planned however it expanded into an 8 month tour from January 2016 to September 2016. The tour did not include Morello or the horn section with the exception of Clemons. The band's second show in Philadelphia on September 9, 2016 was longest show of Springsteen's career clocking in at 4 hours and 4 minutes, two minutes shy of his longest show ever in 2012. An 11 date tour for 2017 being called Summer '17 has been announced. These albums are notable for not using the E Street Band; however, a few members of the band appeared on each of them, including singer Patti Scialfa who appeared on all of them. ↑ Fricke, David (January 21, 2009). "The Band on Bruce: Their Springsteen". Rolling Stone. Retrieved 2009-02-07. ↑ "Bruce Springsteen Bands: from Rogues to E Street Band, passing from Castiles and Steel Mill". ↑ Meeting log, July 9, 2011 cnr E St and 10th Ave, Belmar, NJ. The lady resident of one of the three houses on the corner of E St and 10th Ave stated the misconception and said it was the house one back from the corner from 12th Ave on the same side of the road. i.e 1107 E Street. ↑ "Press Release". Shore Fire. January 30, 2003. Retrieved 2011-10-21. ↑ "Press Release". Shore Fire. August 28, 2007. Retrieved 2011-10-21. ↑ Phillips, Christopher (August 22, 2007). "Dates Are Set! Springsteen Revs Up E Street Machine For Fall". Backstreets.com. Retrieved 2009-03-07. 1 2 3 "Statement", Shore Fire Media, November 21, 2007. ↑ Backstreets.com: Springsteen News accessed March 21, 2008. ↑ AP (April 18, 2008). "Danny Federici of E Street Band dies at 58". 2009 The Associated Press. Retrieved 2009-07-24. ↑ Sean Piccoli (April 17, 2008). "Springsteen concert postponed over bandmate's death". South Florida Sun-Sentinel. Retrieved 2008-04-17. ↑ Backstreets.com: Springsteen News. Retrieved March 21, 2008. 1 2 3 Lapointe, Joe (January 29, 2009). "Springsteen Promises '12-Minute Party' at Halftime". The New York Times. Retrieved 2009-03-07. ↑ Springsteen, Bruce (February 2009). "Super Bowl Journal". Brucespringsteen.com. Retrieved 2009-02-11. ↑ Clemons' Nephew to Play Sax on Springsteen Tour. Associated Press. Retrieved February 11, 2012. ↑ "Inductee explorer - Rock & Roll Hall of Fame". 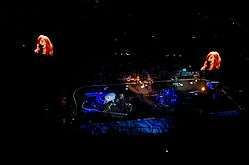 ↑ "Brucebase - 2014-04-10 - BARCLAYS CENTER, BROOKLYN, NY". Wikimedia Commons has media related to E Street Band.